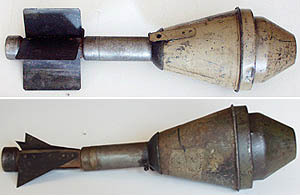 The Panzerfaust was a very successful disposable anti-tank weapon. The M60 designation was derived from its optimal effective range of 60 meters (200 ft.). Well over one million were produced before the end of the war. This very simple and effective weapon operated on the action-reaction principal . Inside the launch tube was a small black powder charge. When fired, the finned bomb moved forward due to the force of the expanding gas. Since the momentum of the warhead was created by reaction to the mass of the high velocity gas exiting out the tube, there was no recoil. 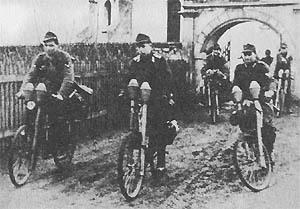 The Panzerfaust was not a rocket launcher, but rather a smooth bore recoilless rifle. The hollow charge warhead was made of thin sheet steel with a wood tail boom. The flexible spring steel fins rolled up around the boom inside the launch tube. As the bomb left the tube they popped opened. Here are two examples showing slightly different fin configurations. 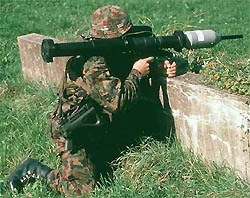 The Panzerfaust concept continues today in modernized forms. 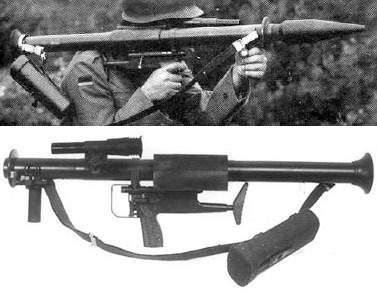 Shown here is a DM-22 HEAT practice projectile used in the German PzF-44 compared with the WWII M60. Note it continues to use the spring-steel fin design. Thanks for the ID Francesco! Modern designs have abandoned fixed spring-steel fins in favor of collapsible fin assemblies, allowing larger fins and greater stability.